To commemorate the 100th anniversary of Scott Joplin’s death (and roughly 150 years since his estimated birth date of 1867), pianist Richard Dowling offers this splendid 3-CD box set containing Joplin’s complete piano works—over 50 waltzes, marches and rags. These include all authenticated Joplin compositions as well as those for which he received an arranging credit. The same cycle of works were performed in their entirety by Dowling in two historic concerts at Carnegie Hall on April 1, 1917, exactly 100 years to the day that Joplin died in New York City. Now widely considered one of America’s most important composers of the late 19th – early 20th century, Joplin’s first solo piano works were published in 1896. His earliest piano rags, including “Original Rag” and the iconic “Maple Leaf Rag,” were printed three years later. This, of course, was the genre that made Joplin famous and cemented his place in history as “The King of Ragtime,” while ragtime’s distinctly African American syncopated rhythms formed the foundation of jazz. Joplin’s career reached its peak from 1908-1914, culminating in the completion of his opera Treemonisha and his most innovative ragtime compositions, including “Fig Leaf” (1908), “Wall Street Rag” (1909), “Euphonic Sounds” (1909) and “Magnetic Rag” (1914). Sadly, Joplin died three years later at age 49—without realizing his plans for a symphony, piano concerto, or the staging of his opera—and nearly forgotten since ragtime music had been overtaken by jazz. Even more tragic from an archival perspective, there are no surviving letters or other personal papers. Dowling and musicologist Bryan S. Wright, who served as co-producer and recording engineer, eschewed the standard chronological programming order in favor of creating a more harmonious musical flow. They succeed brilliantly, and an alphabetical index allows listeners to quickly locate any work among the 54 tracks. Wright also composed the liner notes for the accompanying 72 page booklet, offering tremendous insight with his analysis of each composition, pointing out Joplin’s penchant for striking key changes and innovative modulations. Also included are full color illustrations of the original sheet music covers. 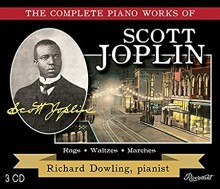 Though there are many recordings of Joplin’s piano works, including the landmark interpretations by Joshua Rifkin who was at the forefront of the Joplin revival in the 1970s, Richard Dowling’s The Complete Piano Works of Scott Joplin is highly recommended for its superb sound, excellent packaging and, last but certainly not least, his carefully articulated, virtuosic performance. This entry was posted in Classical Music, Jazz and tagged African American composers, album review, Bryan S. Wright, CD review, piano music, ragtime, Richard Dowling, Scott Joplin by aaamc. Bookmark the permalink.